November 4, 2017 @ 12:00pm at the Unifor Building10019 Macdonald Ave. 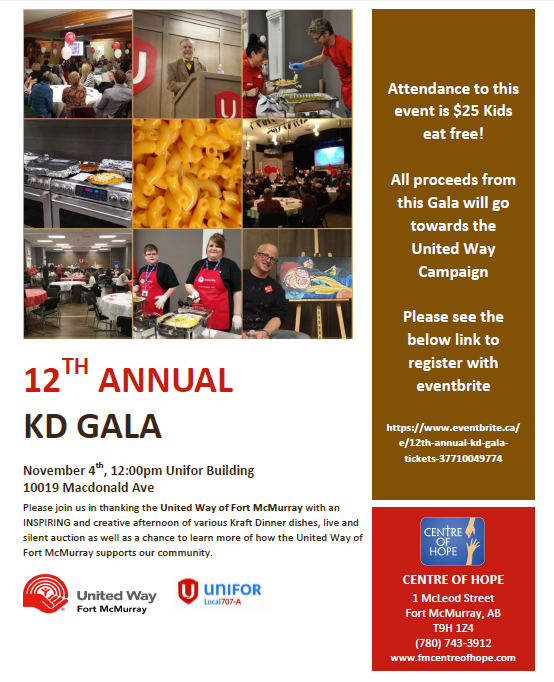 Please join us in thanking the United Way of Fort McMurray with an INSPIRING and creative afternoon of various Kraft Dinner dishes, live and silent auction as well as a chance to learn more about how the United Way of Fort McMurray supports our community. Attendance to this event is $25 and Kids eat free! All proceeds from this Gala will go towards the United Way Campaign. Winter is the hardest time of the year for patrons. Please help give hope today by clicking on the link below to make a donation. Your kindness and generousity will help make a difference this season!